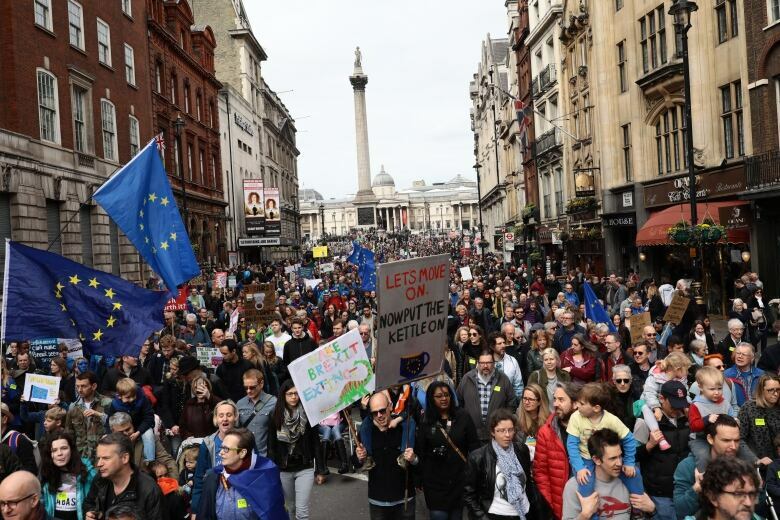 Anti-Brexit protesters flooded into central London by the hundreds of thousands on Saturday, demanding that Britain's Conservative-led government hold a new referendum on whether Britain should leave the European Union. The "People's Vote March" snaked from Park Lane and other locations to converge on the U.K. Parliament, where the fate of Brexit will be decided in the coming weeks. Marchers carried European Union flags and signs praising the longstanding ties between Britain and continental Europe. 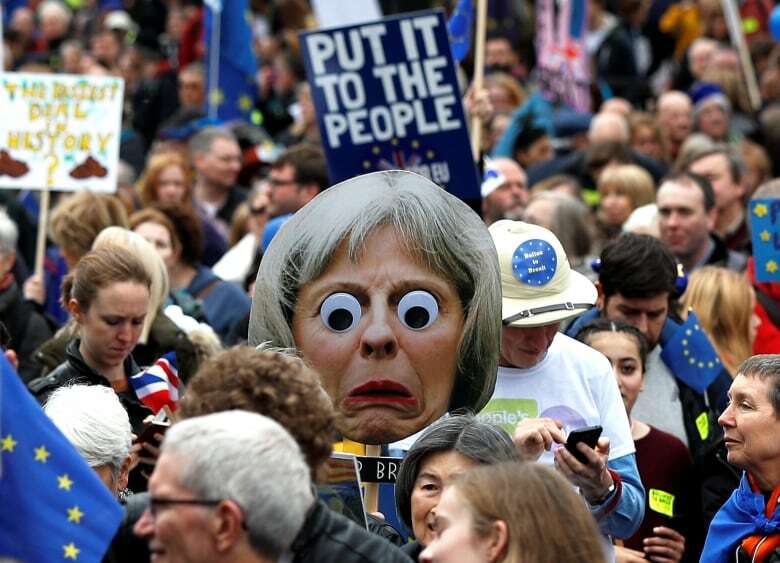 The protest drew people from across Britain who are determined to force Prime Minister Theresa May's government to alter its march toward Brexit. May also is coming under rising pressure from her own Conservative Party to either step down or set a date for her resignation as her political support continues to wilt. The coming week is seen as crucial as political rivals jockey for position to succeed her. Conservative Party legislator George Freeman tweeted that a new leader is needed. "I'm afraid it's all over for the PM. She's done her best. But across the country you can see the anger. Everyone feels betrayed. Government's gridlocked. Trust in democracy collapsing. This can't go on. We need a new PM who can reach out & build some sort of coalition for a Plan B," he tweeted. Liberal Democrat leader Vince Cable, invited to help lead the march in favour of a second referendum, called the crowd gathered in central London impressive and unified. "There is a huge turnout of people here from all walks of life, of all ages and from all over the country," he tweeted. "We are a Remain country now with 60 per cent wanting to stop the Brexit mess." Police did not provide a crowd estimate. Independent legislator Chuka Umunna and others supporting a second Brexit referendum estimated the crowd at 1 million. 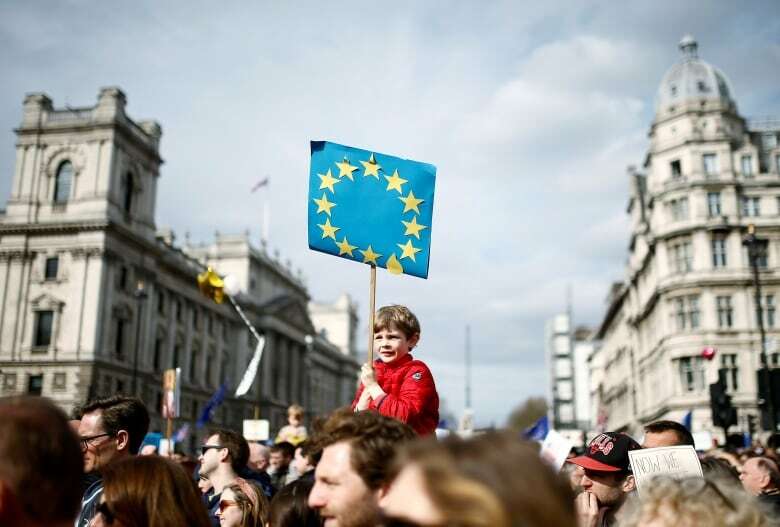 More than 4 million people endorsed an electronic petition this week in favour of revoking Article 50, the act that formally triggered the Brexit process. The march comes as May, who opposes a second referendum on Britain's EU membership, is easing away from plans to hold a third vote on her troubled Brexit withdrawal plan, which has been strongly rejected twice by Parliament. In a letter to lawmakers on Friday night, May said she might not seek passage of her Brexit withdrawal plan in Parliament next week. The embattled leader said she would only bring her EU divorce plan back to Parliament if there seems to be enough backing for it to pass. "If it appears that there is not sufficient support to bring the deal back next week, or the House rejects it again, we can ask for another extension before 12 April, but that will involve holding European Parliament elections," she said. May's changing stance reflects the plan's dismal chances in the House of Commons after two prior defeats. She also says she would need the approval of House Speaker John Bercow to bring the plan back for a third time. Bercow has said a third vote would violate parliamentary rules against repeatedly voting on the same thing unless May's Brexit divorce plan is altered. Almost three years after Britons voted to walk away from the EU, the bloc's leaders this week seized control of the Brexit timetable from May to avert a chaotic departure on March 29 that would be disruptive for the world's biggest trading bloc and deeply damaging for Britain. EU leaders at a summit in Brussels set two deadlines for Britain to leave the bloc of nearly half a billion people or to take an entirely new path in considering its EU future. They agreed to extend the Brexit date until May 22, on the eve of the EU Parliament elections, if May can persuade the British Parliament to endorse her Brexit divorce deal. Failing that, they gave May until April 12 to choose between leaving the bloc without a divorce deal or deciding on a radically new path, such as revoking Britain's decision to leave, holding a new referendum on Brexit or finding a cross-party consensus for a very different kind of Brexit. Despite May's letter to lawmakers, it was not clear what path her minority government would take this week. The anti-Brexit marchers on Saturday included 63-year-old Edmund Sides, who spent the last three weeks walking from Wales to London in order to take part. Sides, a geologist, said he wanted to be able to speak to people along the way, encouraging families that have been split between Leave and Remain to mend their fences and talk. "The whole country isn't doing enough of that," he said. He is worried about the vicious tone that Brexit arguments have started to take and worries about national cohesion. "People fear the atmosphere is very dangerous in this country," Sides said.